St. Ignatius’ Afton Brander heads to the sand on her final leap of the triple jump. She took second in the event with a jump of 32 feet 8.5 inches. 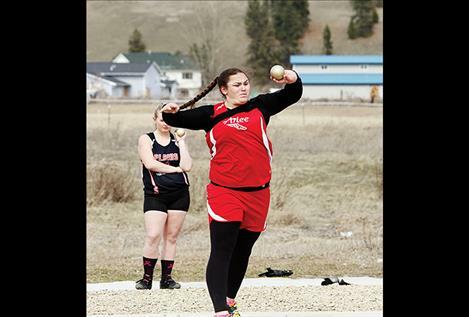 Arlee’s Peyton Lammerding throws in the shot put at Frenchtown on March 29. Her best throw of 33 feet 10 inches earned her third place. Karolyna Buck heads over the bar in the high jump. She took second place and auto qualified for state by clearing 5 feet. 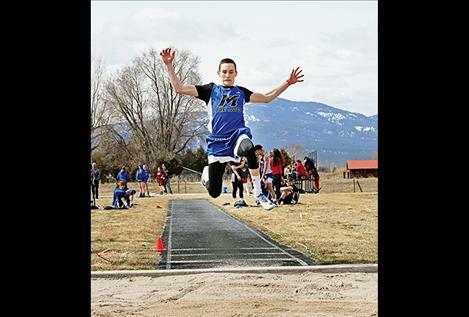 Mission Bulldog Flint McPherson flies through the air in the Long Jump at the Jim Johnson Invitation at Frenchtown Thursday, March 29. 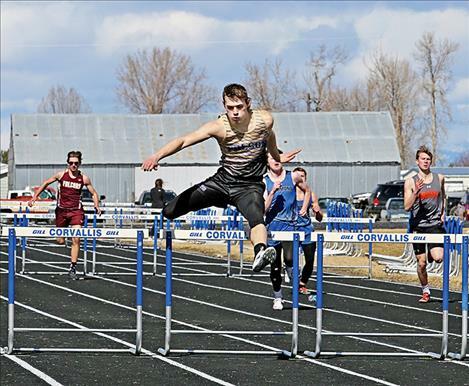 Polson’s Colton Cote clears the final hurdle of the 300-meter hurdles at the Gene Hughes Invitational on March 24. Cote won the event with a time of 50.02 seconds. 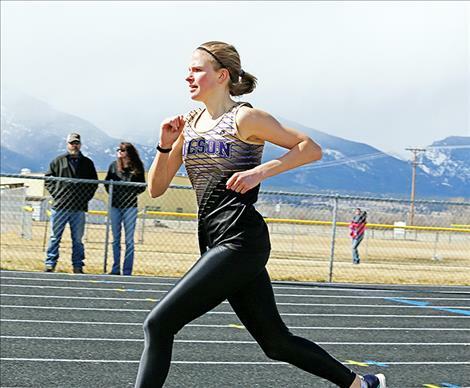 Polson’s Bea Frissell heads down the final stretch of the 800-meter at the Gene Hughes Invitational track meet on March 24. She finished in 2:32.37 seconds earning the Polson Varsity Girls their only first place in Corvallis. 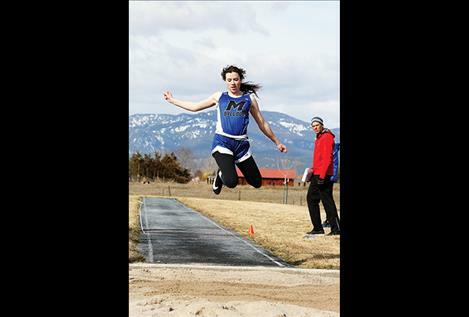 On Thursday at the Jim Johnson Invitational in Frenchtown, the Mission Bulldogs boys track & field team placed eighth out of 17 teams, while the Lady Bulldogs finished seventh and the Arlee Scarlets finished sixteenth. Mission Bulldog Michael Durglo placed second in the javelin with a throw of 146 feet, 9 inches and placed third in both shot put and discus. Lady Bulldog Afton Brander finished second in the triple-jump, fourth in the high-jump and fifth in the long-jump, while teammate and sister Syd Brander placed fifth in the 100 and fourth in the triple-jump. 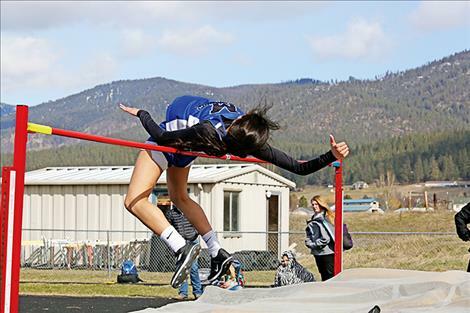 Karolyna Buck claimed second in the high-jump with a state qualifying mark of 5-feet even. Buck raced to a sixth-place finish in the 800 and a fifth-place finish in the 1600.